Concessionary (Monday – Thursday performances only): Students, senior citizens (65+), unemployed and Leisure Key holders. Monday 'Two for One' ticket offer: cheapest ticket is free - main stage only. The Garrick Box Office is open from 6.45-7.45pm on show nights. For your convenience, the car park next door at Applicon House on Exchange Street is open from 6.30pm on show nights. Please make cheques payable to 'Stockport Garrick Theatre Ltd'. If your nominated seats are already taken, we will place you as close to them as we can. 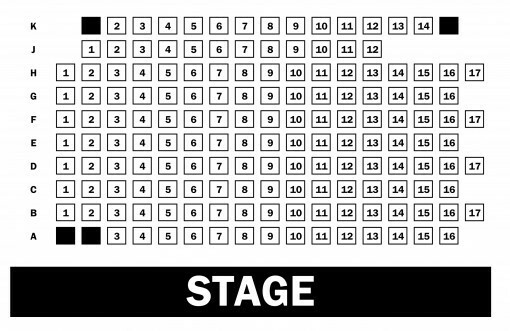 See below for our Main Stage seating plan. As our Studio seats are unreserved, there is no seating plan for those. Please include an email address or telephone number with your order so that we can contact you to let you know your order has been processed. Your tickets will then be kept in the Box Office ready for collection on the night of the show. If you would like your tickets to be mailed back to you, please enclose a stamped, self-addressed envelope. Tickets can also be purchased over the counter at the Stockport Plaza Box Office, Mersey Square, Stockport SK1 1SP. Mon to Fri 10am - 6pm, Sat 10am - 4pm. It can also be open later into the evening when there is a show on at the Plaza (check the Stockport Plaza website for full details). Please note that, apart from ticket sale facilities, Stockport Garrick Theatre and Stockport Plaza are totally separate operations. Online sales are handled by Quay Tickets and hosted on the Stockport Plaza website and at various other web locations. Online sales are subject to a booking fee of £1.25 per seat. There is a compulsory £2.00 postage charge made for orders booked more than five days ahead of the TICKET DATE. Orders after this time can be collected at the Stockport Garrick Box Office with no postage fee. Telephone sales are handled by Quay Tickets. Although the automated greeting message at the start of the call may make reference to Stockport Plaza, the Plaza and Garrick are both separate operations. Telephone sales are subject to a booking fee of £1.25 per seat. With every 10th ticket, one person goes free! Email boxofficemanager@stockportgarrick.co.uk / 0771 896 6726 (please note that this offer is only available from the Garrick directly, not from our booking agents, Stockport Plaza and Quay Tickets). A Season Ticket is great value, offering a saving of up to 25% on the standard price and, if you book ahead of a season’s start, you can also take advantage of our annual 'Early Bird' offer and save even more money! After each show, we reduce the price of our Season Ticket so you can take advantage of the savings at any point in our theatre year. Please download the Booklet and Application Form below for full details. Or to become a regular season ticket subscriber, simply fill in your details into the form below to submit your details to the box office.